Stacking up: Maran’s Sun Direct is expected to get an investment of up to $670 million over the next five years. 2 min read . 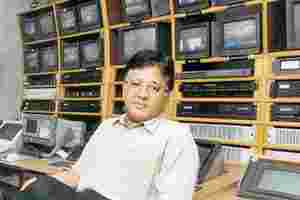 Updated: 26 Sep 2007, 12:14 AM IST John Samuel Raja D.
Chennai: An investment of Rs150 crore in February 2005 to start Sun Direct, a direct-to-home, or DTH, satellite television service in Tamil Nadu that has just rolled out, has already ballooned into a Rs3,320 enterprise for media baron Kalanithi Maran—even before its first subscribers have signed on. Sun TV Network offers cable television and, other than sharing its promoter, has nothing to do with Sun Direct. Maran’s 79.5% stake in Sun TV Networks, meanwhile, is worth Rs11,275 crore, based on the company’s Tuesday closing price of Rs355.80 a share on the Bombay Stock Exchange. Astro’s valuation of Sun Direct, at Rs3,320 crore, is in sharp contrast to Dish TV, a DTH service provider from the Zee Group, which has some two million subscribers. Dish is valued at Rs3,115 crore based on Tuesday’s closing price of Rs72.80 on the National Stock Exchange. It is unclear why Astro was willing to pay what it paid for a stake in Sun Direct. Neither Maran nor Astro responded to Mint’s calls and an email. Documents reviewed by Mint also indicate that Sun Direct is projected to make a loss of $166 million in the first five years of operations, the amount that the Astro group has paid for its 20% stake. Documents also indicate that the partners may invest up to $670 million in Sun Direct over the next five years, which will be funded with a combination of equity and debt. The operation is projected to become “cash positive" only in the sixth year of operations. The market for DTH services in India is projected to increase rapidly over the next few years. Media Partners Asia have estimated that the penetration of the pay TV market will cross the 90% mark by 2015, from the current level of 61%. This is likely to bring 37.6 million households under the pay TV market. Sun Direct faces competition as it starts to roll out its offerings. Dish TV from the Zee Group and Tata Sky, a joint venture between the Tata group and Star Network, are already operating in Tamil Nadu. Meanwhile, apart from Sun, Anil Ambani’s Reliance-ADAG and Bharti Airtel Ltd, India’s largest mobile phone service provider by subscribers, have received licences to launch DTH services though their specific Tamil Nadu plans are not yet known. Maran and his brother Dayanidhi, until recently India’s telecommunications minister, have significant economic and political clout in the state. But the brothers have recently fallen out with the state chief minister M. Karunanidhi, leaving them in political limbo.